Normally I will just use the overnight rice and stir fry with butter and eggs. Since this is the last minutes request, so I adapted Wendy's garlic rice recipe which her recipe is easy and simple, the difference from her recipe is I added with more butter. Thanks to Wendy for kind sharing !! 1. 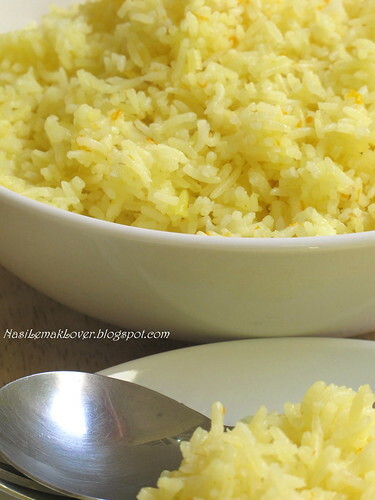 Mix all ingredients in a rice cooker and cook. 2. Fluff rice with chopsticks before serving. If we substitute Basmati rice with normal white rice, would the taste still be the same? 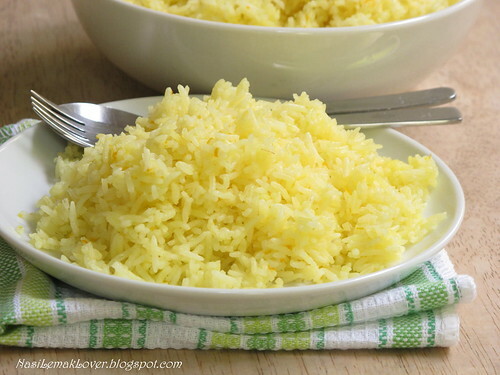 What side dishes would compliment with butter rice? I hope the rice was well recieved at the party. Wow, u used 3 cups basmathi with 4 cups water?? Enough water meh? Basmathi needs a lot of water one woh. must smell good using butter!! RO, yes, you can subsitute with normal white rice, I did it some time when i run out of basmati rice, the taste will have slight difference. The side dish to accompany with this butter rice is curry or rendang..
cikmanggis, ya, good choice to have it with Rendang. Wendy, typo error, should be 5 cups, because i just agak agak only..
My Asian Kitchen, yes, this rice really smell good, kids especially like this kind of rice. It's a lovely simple dish. I sometimes cook like this accompanied by curry. Thanks for sharing. Hope you are doing well Sonia. this is double guilty if i had this! i like butter rice a lot which makes me like chicken rice a lot too :D urs seems to be very fragrant~ thanks for sharing.. 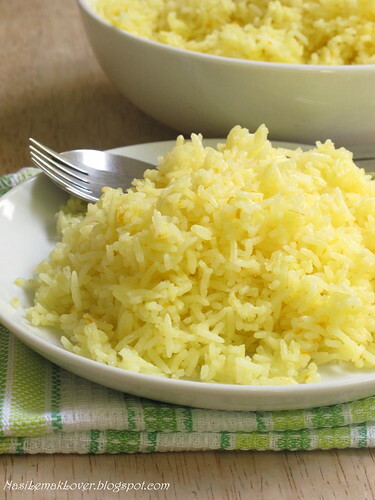 The aroma of garlicky ,buttery rice is simply irresistible. I love it! Mmm...can smell the buttery rice from here. Any side dishes to go with it. WOw sonia simple and tasty butter rice.Love that u add coconut.Will give a try. I have bookmarked Wendy's garlic rice too, now more tempting to give a try. Butter rice looks superb Sonia,my fav any day. wow, I can smell the butter and garlic from here! Looks good and easy to prepare. Will cook this for my kids. I bet they'll love it! mmm...i can already smell how fragrant this is! oohh..this might taste like Hainanese rice?? My mom cook this rice as our home style chicken rice (steam chicken)...simple and nice! Mmm, this sounds so good! Do I need to melt the butter first? Or do I simply cut into cubes and add to the uncooked rice? 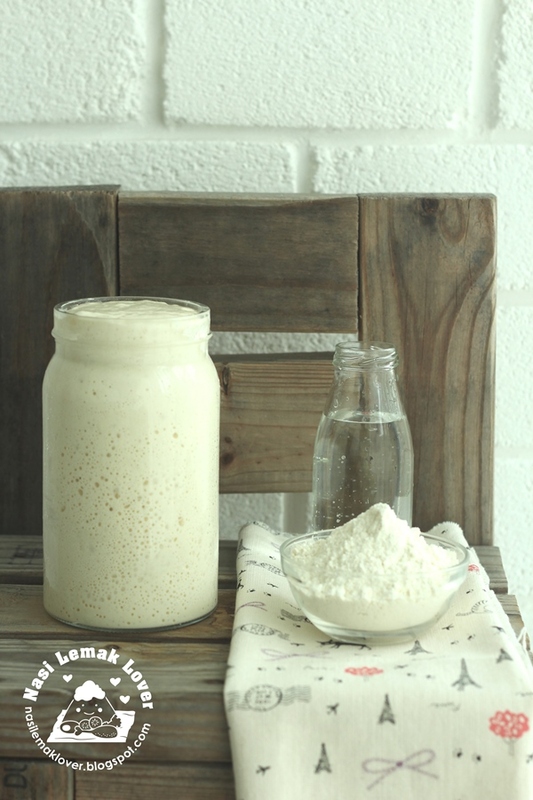 I wonder what makes you think lemak means butter. Nasi lemak(malay) means rice with milk (in most case is coconut milk). It is added with pandan(screwpine) leaves to enhance its fragrance. What an idea, butter Basmati rice with a rich smell of butter. wow. Good recipe.